You’ve landed here after looking for information about the Ken Doll Cake we made for a customer. This controversy has definitely taken us by surprise. We make cakes – and lots of other amazing things. 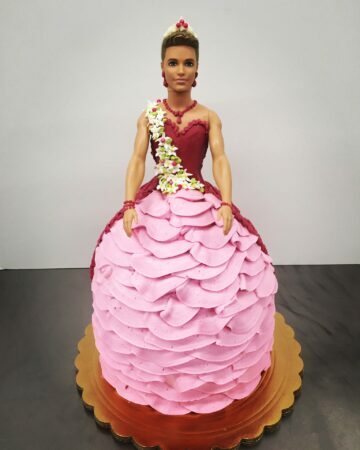 A customer requested a Ken doll cake and we were happy to make it; she loved the cake when she picked it up. We were especially proud of its buttercream detail so we decided to post a photo of it on our Facebook page, as we do with many of the cakes we design and adore. We got some lovely responses along with some negative feedback. We deleted the ones we felt weren’t helpful to anyone. A few days later, we noticed a large number of unlikes on our page and realized they were a result of our Ken cake post. We reposted the picture asking for support from our Facebook friends. Luckily, we have received that support and so much more from our fans, devoted customers and staff. At Freeport Bakery, we believe there’s no better way to celebrate something special than with a wonderful dessert. We remain proudly committed to creating delicious and remarkable cakes that make our customers feel seen, loved and celebrated.